Faramir yawned and stirred as the servant tapped on his door with his morning tea. Waking alone in his apartment in the Citadel was a more leisurely affair than when he was at home with Éowyn and his children where he was usually rudely awakened by the baby in his crib crying to be fed. Nevertheless he missed them. He even missed his favourite hound, a treasured gift from the King, greeting him each morning. Faramir was only melancholy for a moment, though when he remembered his plans for the day. He had a meeting with the King that morning and would dine with him and the Queen that night. Maybe if the day's business was swiftly concluded they might even be able to go out riding for an hour. Faramir often thought he was the most the most fortunate man on Middle-earth. He served a King whom he loved and admired, was married to the loveliest of ladies; he was certain his children were the fairest in Gondor and he loved his work, serving the land he was devoted to. The Steward hummed contentedly to himself as he drank his tea. The morning sun streamed through the window and it promised to be a fine day. The servant had also brought him a message, which was marked as both urgent and confidential. Faramir, at Aragorn's behest had been conducting some delicate trade negotiations with Khand. Noticing that the seal was that of the Lord of Khand, he tore open the message with some apprehension, but smiled with delight when he read it. Lord Abioye wrote that he wished to give his consent to trade with Gondor, provided that the merchants of Khand could trade a certain amount of pearls for mithril in Gondor's markets. The letter instructed Faramir to take the letter to the Ambassador from Khand together with the discussed trade agreement so that the deal could be quietly concluded, as certain factions in both Khand and Gondor were opposed to trade between their two nations. Faramir folded the parchment and placed it on the table as the servant returned to take away his empty cup and lay out his clothes for the day. Faramir asked him to open his window and prepare the bath for his morning ablutions. The fresh autumn breeze chased away the last vestiges of sleepiness as he prepared for the day ahead. "I have excellent news to tell you!" Faramir informed Aragorn as soon as he entered the King's study shortly after breakfast. "Lord Abioye has agreed to trade with us. We just need to draw up a treaty and send it together with this document to his ambassador." That is wonderful news, my friend!" Aragorn exclaimed. "I expected the negotiations to take months or even years." "Reading between the lines, I think Lord Abioye's chief wife has a fancy for mithril bracelets," said Faramir. "Just as our ladies have a liking for their pearls," said Aragorn. "Let me see the letter then." "I have it here." Faramir rummaged amongst the sheaf of papers in his hands and frowned. "I put it here, but this is the bill for the repairs to the third circle, and this is the invitation to dinner with Ambassador Tahir. It must be here!" Frantically, he leafed through the parchments." You look, please!" he asked Aragorn after a third attempt failed to produce it. "Are you certain you had such a document?" Aragorn demanded after an equally fruitless search. "Maybe you dreamed that you had? Perhaps you have been working too hard on the treaty?" "No, sire," Faramir protested. "I did have the parchment in my hand but an hour ago." "How could you be so careless then as to lose it?" Anger flashed in Aragorn's eyes. "You know how much this agreement means to Gondor and how long we have worked for it. Lord Abioye is not an easy man." "I cannot see how I could have lost it," said Faramir. I opened it and put it on the table when I had read it. I was there in the room when my servant prepared my bath and I locked the door after he left. Maybe if I ask Lord Abioye to send another copy he will?" "He is more likely to demand that I send him your head on a platter for having lost it!" Aragorn snapped. "This is most unlike you, Faramir, I have never known you mislay an important document, or indeed any document before. Yet you have every trivial report here, but not the one document that matters! We will say no more of it for now and try and get some other work done." Faramir worked doubly hard that morning, but although the King reproached him no further, he knew that Aragorn was very angry. The Steward did not blame him, as he knew Aragorn had laboured long to obtain the treaty as well as attending several highly tedious dinners with the ambassador from Khand. It seemed now that all the hard work was for nothing. When the bell rang for the noonday meal, he was glad to take his leave of the King and made his excuses not to attend dinner with him and Queen Arwen that evening, certain that Aragorn would not wish to have to behold him again that day. Aragorn did not attempt to change his Steward's mind. Faramir did not feel like eating and returned at once to his chambers, which he preceded to search inch by inch for the missing document. He searched under the bedclothes, in every pocket and even under the rugs, but all in vain. After several hours of fruitless searching, in which he found nothing save the oilskin in which the document had been wrapped, Faramir sank down the bed despondently. He did not fear Aragorn's anger, unlike he had that of his father, but letting down a man whom he loved and respected, was far worse than punishment that could be meted out to him. Aragorn had trusted him and he had let his lord down, and Gondor too. So many of Gondor's folk would have profited from the treaty; not just rich merchants, but craftsman and labourers and even poor widows who earned a living threading beads in their homes. He would gladly have begged Lord Abioye for another document, but knew all too well that the proud ruler of Khand would be outraged that he had lost the first one and immediately refuse all further negotiations. It was believed that everything a lord of Khand touched was sacred to their gods. Faramir shuddered. What if his carelessness led to war? "Valar help me!" Faramir pleaded desperately. He closed his eyes and tried once again to think where the precious document might be. Faramir felt his hand being gently licked. For a moment he thought that somehow his faithful hound had come to comfort him in the Citadel. Then he opened his eyes and struggled to suppress a cry of alarm when he beheld an enormous wolfhound standing beside him. The creature was almost as large as a pony and only just fit comfortably into the chamber. Yet it continued to gently lick his hand and wagged its tail, threatening to dislodge a portrait of Éowyn and the children, which stood on the dressing table. "Have no fear, Faramir, son of Denethor, faithful servant of Aragorn Elessar," said the wolfhound. "Nothing is lost that I cannot find. I have come to your aid." "Huan?" 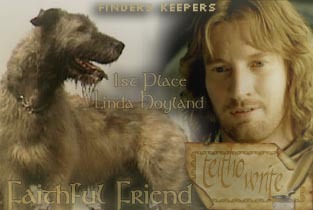 Faramir regarded the great hound in wonder. "You know me then, Faramir?" The Hound sounded pleased. "All men of learning know your story," Faramir replied. "How you aided fair Lúthien and brave Beren in their trials, but were slain at last by the terrible wolf." The hound sighed. " I miss Lúthien still. Never was there a sweeter nor fairer lady than my mistress. She is gone forever with her beloved beyond the circles of the world, while I was permitted to return to my master Oromë in the Blessed Realm and granted to now speak whenever I will. He has sent me forth to find that which is lost. You called for aid, Faramir, and as you care tenderly for one of my kindred, I am come. There is no scent that I cannot follow." Faramir held out the oilskin to the hound. Huan sniffed it thoroughly and then made straight for a heavy linen chest that stood at the far side of the room." "The parchment is there? But however did it come to be amongst my clean shirts? I searched amongst them but an hour ago." "The paper is not in the chest but beneath it." Faramir knelt on the ground and sure enough there was a gap just large enough for a thick parchment to be concealed beneath. He patted Huan gratefully. "Faramir! Are you well, ion nîn? Faramir?" The Steward was roused by Aragorn calling him. "Come in!" he called. Aragorn entered his chamber looking concerned. " I am sorry I was so angry earlier," he said. "Everyone loses something occasionally. I feared that you might be troubled still over the lost document. Your cook told me that you ate nothing at midday. Come and dine with Arwen and I. I would not have you alone and in distress." "I believe the document is under the linen chest," said Faramir, rising from the bed. "I will just pull it out." "Let me help you," said Aragorn. Together they hauled the heavy chest to one side to reveal to document beneath. 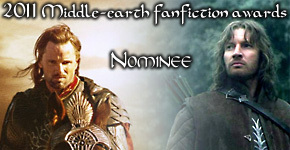 Faramir bent to retrieve it and handed it to Aragorn his eyes bright with joy and gratitude. "I wonder how it came to be here?" he said. Aragorn looked around the room. His eyes moved towards the open window. "I would guess a sudden gust of wind blew the document under the linen chest," he said thoughtfully. "It has mostly been a gentle breeze today, but there were one or two strong gusts. Arwen was complaining that a branch snapped off her favourite rose bush and Farawyn was crying that her doll's bonnet blew away. But how did you realise it was here?" Faramir rubbed his eyes. "Huan found it for me," he said. "Huan the Hound of Valinor?" "I suppose I must have been dreaming, but it was so vivid. He was here in the room with me. He told me that he had been sent because of my love for the pup of his line that you gave me and because I called upon the Valar for help." "There are many things that we cannot understand, ion nîn. Now come and eat, you must be very hungry." With a protective arm lightly draped around his Steward's shoulder, and the precious parchment in his free hand Aragorn led his friend to the dining room where an evening of friendship and good food awaited. This story was originally written as a birthday gift for Raksha. An altered version was entered in the Teitho contest, where it was placed first.